This fabulous statement watch from the Thomas Sabo collection is the perfect accessory to complete your arm stack. 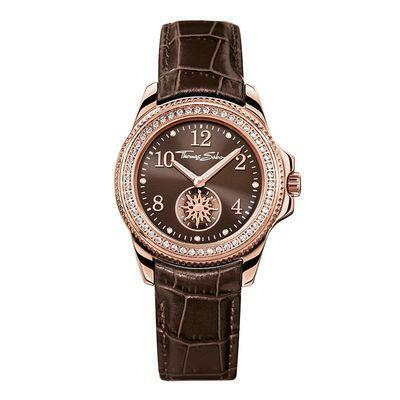 This detailed timepiece is crafted in rose gold coloured Stainless Steel with an exquisite brown crocodile print leather strap. The shiny brown dial has a rotating sun motif with glistening accents, rose gold hands and hour markers, a rotatable bezel and non-reflecting mineral glass with a sapphire coating. The warm rose gold colouring harmonises perfectly with the glistening cubic zirconia embellishment on the bezel for a glamorous finish.